These financial centers are at risk of major property price corrections. If you had $1 billion to spend on safe real estate assets, where would you look to buy? But what happens when too many people pile into a “safe” asset? According to UBS, certain cities have seen prices rise at rates that are potentially not sustainable – and eight of these financial centers are at risk of having real estate bubbles that could eventually deflate. Every year, UBS publishes the Global Real Estate Bubble Index, and the most recent edition shows several key markets in bubble territory. The bank highlights Toronto as the biggest potential bubble risk, noting that real prices have doubled over 13 years, while real rents and real income have only increased 5% and 10% respectively. However, the largest city in Canada was certainly not the only global financial center with real estate appreciating at rapid rates in the last year. 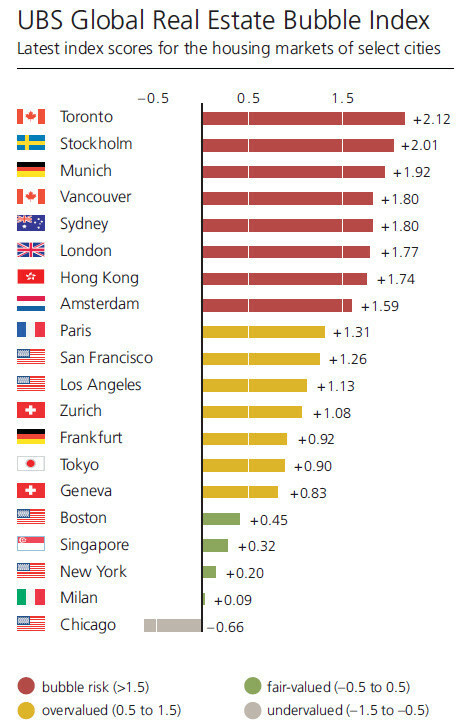 In Munich, Toronto, Amsterdam, Sydney and Hong Kong, prices rose more than 10% in the last year alone. Annual increases at a 10% clip would lead to the doubling of prices every seven years, something the bank says is unsustainable. In the last year, there were three key markets where prices did not rise: London, Milan, and Singapore. London is particularly notable, since it holds more millionaires than any other city in the world and is rated as the #1 financial center globally.